Budgeting is one thing I’m learning a lot about now I’m a student. I’ve always been really good with my money (One of my favourite childhood stories was when I went to Disneyland Florida with my family. Me and my sisters were each given a little bit of pocket money each morning for ice creams and stuff throughout the day, but I saved it all up and on the last day I went and bought the biggest cuddly Eeyore I could find! I still have it and I think its one of the best budgeting lessons I learnt as a child! ), but this year it’s calculators at the ready because it’s a lot more complicated. As such, I’m looking for those little shortcuts and cheats so I can eat good, healthy, tasty food without completely blowing my food allowance! So the recipe I am going to share with you is Potato Dauphinoise. My mum used to make it and I’m a total sucker for creamy, cheesy food. Now traditional Dauphinoise is not that hard to make, you can see this recipe here has only has five ingredients. This week I had cooked some other fancier meals so I needed to make this one a little bit cheaper. 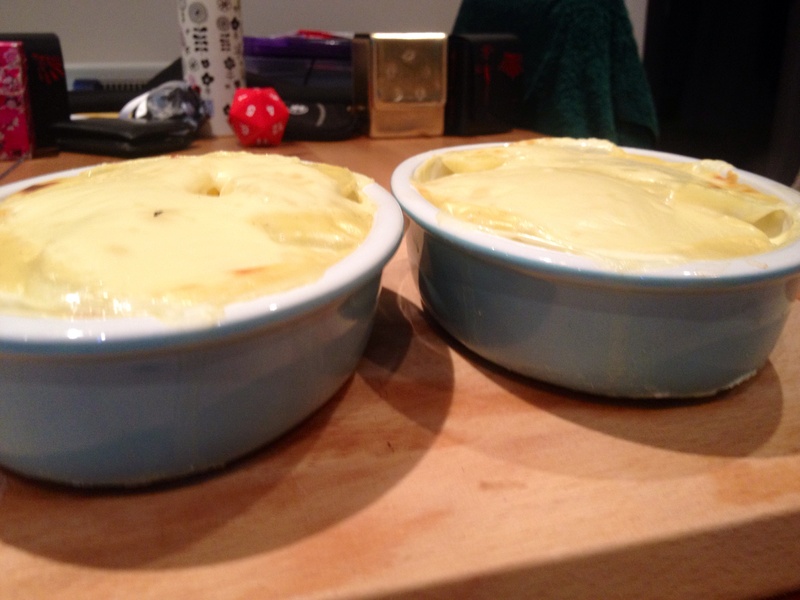 Potato’s were easy enough but the double cream and gruyere (as much as I love it) were out of my reach. So instead (I’m cringing writing this because I know my mum’s going to read this at some point and kill me) I bought a cheese sauce mix. This is a big deal and something I never thought I’d do. If I want a cheese sauce I would make a roux from flour and butter, add milk and add the cheese. It’s not too hard when you know how but I would’ve needed to get all the ingredients to make it – and that did not make a happy spreadsheet.. I made up the sauce, added some black pepper, put some sliced cheese on top and it didn’t taste too bad. There’s even some left to take for lunch tomorrow! (Can’t really comment on how healthy it was – anything you make yourself is arguably better for you) Here’s a picture of mine, it would’ve gone more brown and bubbly on top but I only moved it to the top shelf in the last five minutes of cooking which wasn’t quite enough to go brown! First I par-boiled the sliced potatoes in a pan of water. You want them to start going tender and loose their crisp, just not too much or they turn to mash when you try and fish them out! Then you layer them in your dish, put a couple of table spoons of sauce in between each layer and I added a heaped tablespoon of sweetcorn because I think I might be addicted because it’s a good source of fibre and helped pad it out. Pour whatever sauce you have left on top (being careful not to fill the dish too much because it will bubble and spill when it bakes) and put your sliced/grated cheese on top. ← My First Attempt at Stuffed Peppers and Corgettes!